Rio joins the seemingly ever-growing queue of recent animated films which do just about the bare minimum to keep you interested and make you laugh and not a lot more besides. Throwing an all star cast at the screen and hoping something sticks in the recognition banks is merely one of the regular tricks on show here, with Jesse Eisenberg and Anne Hathaway's intonations distracting anyone familiar enough with the actors to notice them. Eisenberg's parrot, Blu, whose surname is presumably Ray, features that neat animal animation trick of not being able to perform one of his key functions in life, in this case, flight. Like Bambi, the nimble deer who who couldn't stand; Scooby-Doo, the investigative dog who suffered from cowardice and Monsters Inc's scarers, who were just as scared of their targets as their targets were of them, Blu is part of a long line of animals whose basic functions are manipulated for laughs. Its lazy but, hey, you can't argue with the tropes ability to generate a few moments of solid slapstick. 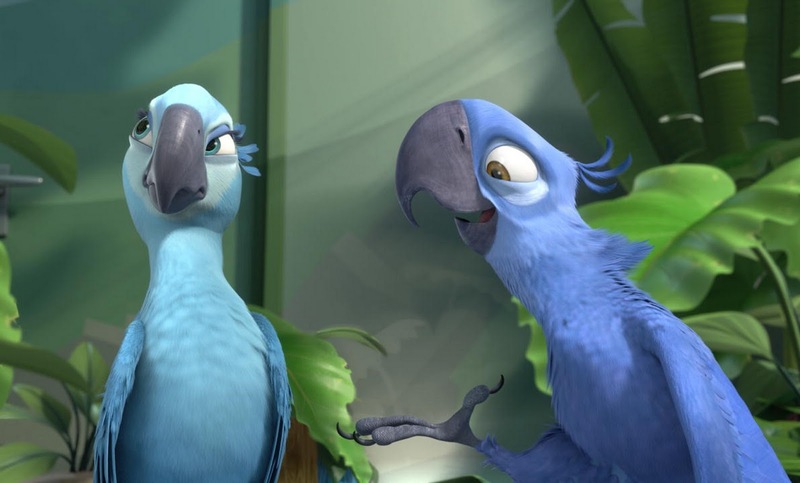 Early scenes with Blu and 'parent' Linda (Leslie Mann) are amongst the most charming, as are the earliest moments of parent and parrot's journey to Brazil, with Jewell's (Hathaway) introduction also a highlight. From here on in though Rio gets bogged down in a standard kidnap drama with human villains that never feel anything other than comedy and a ropey looking bird villain (voiced by Flight Of The Conchords' Jemaine Clement), who feels misjudged, non-threatening and a bit out of kilter with the rest of the film. After a strong period during the early noughties, culminating in the magnificent Wall-E, animated films feel rather like they've slipped back to being satisfied with average. There's no way Rio is a bad film but nor can it claim that it looks as high or touches as deep as Pixar's robot, which moved in such unexpected genres as Science-Fiction and Silent cinema, where director Carlos Saldanha has here merely settled for plopping comedy animals on the screen. Where are the Wall-E imitators? Where's the aspiration? Where's the plot that doesn't need a third act comedy bulldog to function? Could not agree more with your last point, as animation seems to have more aesthetically pleasing, its like they've left the aspect of story/character in the doldrums. 90s was a heyday for me as a kid in terms of animation (film and tv) but nowadays i catch myself wandering whether animation is either - of the same quality it was when i was young but I've changed in terms of taste OR whether i can now understand what i liked about those animations and find these modern ones severely lacking. I think there's a lot lacking in modern day animation and I think it has lapsed into making sure everything is as pretty as possible, with a character kids can buy the toy of. There are some exceptions (I really liked THE PRINCESS AND THE FROG for example) but I do think it is a genre sliding slightly towards the doldrums - one awarding body has already decided against a Best Animated award this year because of the standard of the competition!